Vinyl siding is a cheap alternative to other home exterior materials with a number of benefits. First, vinyl siding is durable and can last decades without any damage. Second, it does not have to be painted (it already comes in the color). Thirdly, the color on the vinyl siding fades very slowly, making your home look brand new long after your neighbor's paint has begun to crack and chip. 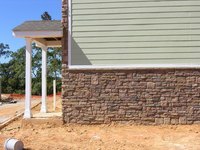 Despite all these benefits, it is still possible for vinyl siding to crack. If a crack does occur, all you need to do is replace the damaged pieces and insert new ones. Remove the cracked vinyl siding with a zip tool. The zip tool is a prying tool specifically made for vinyl siding that will reduce any damage to the home and the siding during the removal process. Measure the cracked siding with a tape measure. Cut a new piece of siding with a table saw to the measurement specifications of the cracked vinyl siding piece. Take the new piece of vinyl siding you just cut with the table saw and place it where the cracked siding was removed. Vinyl sidings have clipboards on the top and bottom that hold overlapping pieces in place. You can use these clipboards by sliding the new piece of siding under the top piece. Once it is in secured at the top, simply push the bottom of the siding in until it is overlapped by the bottom piece. This should secure the bottom clipboard. Use the zip tool to wedge the siding in if necessary. The blade on the table saw should be installed backwards so the teeth on the blade are facing the opposite direction they usually face. This will make for a slower but much cleaner cut to the vinyl siding.